In the aftermath of the shooting of Michael Brown in Ferguson, Missouri, some of the media coverage has focused on a generational divide among blacks: the old guard that marched and protested in the 1960s under Dr. Martin Luther King, Jr.’s mantra of nonviolent civil disobedience, and today’s young adults who use social media to galvanize their message. Recent survey data from the Pew Research Center suggest that there is a sharp divide between younger and older blacks on the issue of police searches. Older blacks (those ages 60 and older) are evenly split when it comes to what tactics the police should use in pursuing crime suspects. Some 46% say the police should be allowed to stop and search anyone who fits the general description of a crime suspect, while roughly the same share (50%) say the police should not be able to search people just because they think they look suspicious. Young and middle-aged blacks have a much different perspective. Fully 70% of blacks under age 40 and a similar share of those ages 40 to 59 (68%) say the police should not be able to search people without cause, while only about three-in-ten say they should be allowed to search anyone who resembles a crime suspect. Pew Research asked this question of 3,335 adults nationwide earlier this year, before the events in Ferguson, as part of a broader survey on politics and values. The survey found a similar age pattern among whites — with younger whites more strongly opposed to police searching people just because they look suspicious, while older whites were evenly divided on the issue. Overall, blacks are more likely than whites to be skeptical about police search tactics: 66% of all black adults compared with 53% of all whites say the police should not be able to search people just because they think they look suspicious. New Pew Research survey data, collected after the Ferguson shooting, finds blacks and whites are sharply divided in their assessments of police performance, both locally and nationwide. Blacks are also divided about the impact racial discrimination has on black progress today, but the age groups align slightly differently on this measure. 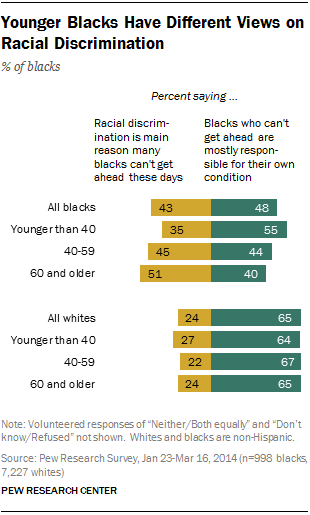 Survey respondents in the pre-Ferguson Pew Research poll were asked which of the following statements came closer to their own views: Racial discrimination is the main reason why many black people can’t get ahead these days, or blacks who can’t get ahead in this country are mostly responsible for their own condition. Overall, blacks split fairly evenly on this question, with 43% choosing the first statement and 48% choosing the second one. Younger blacks (those ages 18 to 39) are less likely than middle-aged and older blacks to say that racial discrimination is the main reason why many black people can’t get ahead these days. Only about one-third of younger blacks (35%) express this viewpoint, compared with 45% of blacks ages 40 to 59 and 51% of those ages 60 and older. Younger blacks are more likely than their older counterparts to align themselves with the alternative point of view — that blacks who can’t get ahead in this country are mostly responsible for their own condition. Some 55% of blacks under age 40 say this statement comes closer to their views. By comparison, roughly four-in-ten blacks ages 40 and older say the same. The Pew Research survey also asked about the progress that’s been made toward providing blacks with equal rights. On this measure there is greater agreement across age groups. When asked whether enough has been done in this country to give blacks equal rights with whites, 79% of all blacks say more change is needed to bring about equality. Younger blacks (those ages 18 to 39) are somewhat more likely than those ages 60 and older to say that we’ve made the changes needed to give blacks equal rights (21% vs. 12%). Still, the vast majority (75% of young blacks and 84% of older blacks) say our country needs to continue making changes.